SANTA BARBARA, June 22nd – Be Green Packaging announced today that its line of plant-based food packaging has achieved USDA BioPreferred status. The company’s packaging, which is composed of wild-harvested plant fibers such as bulrush and bamboo, qualified for the labeling due to its high level of ‘biobased’ content. According to the USDA’s website, the term ‘biobased’ refers to commercial or industrial products (other than food or feed) that are composed in whole, or in significant part, of biological products, renewable agricultural materials (including plant, animal, and marine materials), or forestry materials. The BioPreferred label was created by the USDA in 2002 in order to encourage consumers and government agencies to identify and use products which meet the programs biobased content standards. Products that achieve BioPreferred status receive preference for all government contracts over those that do not. In addition to the BioPreferred label, Be Green’s line of food service packaging has also garnered independent, 3rd party certification from a host of organizations such as the Cradle to Cradle Products Innovation Institute, Biodegradable Products Institute (BPI), Western Michigan University’s Recycling Program, and the Non-GMO Project, among others. SANTA BARBARA, Calif.; June 13th, 2011 – DuPont Packaging & Industrial Polymers has announced the winners of its 23rd Annual Awards for Packaging Innovation, naming Be Green Packaging and Proctor & Gamble as the recipients of its highest honor, the prestigious Diamond Award. 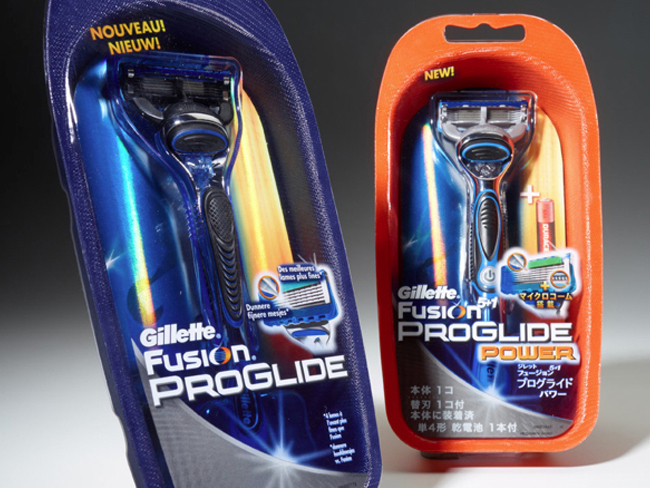 The companies garnered the accolade for their recent collaboration on the design of Gillette’s new Fusion Pro Glide razor packaging trays. The new trays, which are composed of plant-based fibers, reduced cost and material weight while maintaining Gillette’s distinctive product packaging. Be Green is known for its line of compostable and recyclable packaging that is also manufactured from plant-based materials similar to those used in the Gillette Fusion ProGlide trays. Three billion times a day, P&G brands touch the lives of people around the world. The company has one of the strongest portfolios of trusted, quality, leadership brands, including Pampers®, Tide®, Ariel®, Always®, Whisper®, Pantene®, Mach3®, Bounty®, Dawn®, Pringles®, Charmin®, Downy®, Lenor®, Iams®, Crest®, Oral-B®, Actonel®, Duracell®, Olay®, Head & Shoulders®, Wella®, Gillette®, and Braun®. The P&G community consists of over 135,000 employees working in over 80 countries worldwide. Please visit http://www.pg.com for the latest news and in-depth information about P&G and its brands. SANTA BARBARA, June 6th, 2011 – Be Green Packaging, LLC announced today that it has engaged The Austin Company, a leading design, engineering, and construction firm who will undertake the development of the company’s new $7.3 million dollar manufacturing facility in Ridgeland, South Carolina. Earlier this year, Be Green announced the purchase of the 27-acre property where it will house the nation’s first plant-based, compostable packaging facility operating under the Cradle to Cradle Products Innovation Institute’s sustainability standards. Based out of Santa Barbara, California, Be Green is making a name for itself in the emerging sustainable packaging sector by working with a diverse portfolio of clients such as Whole Foods Market, P&G’s GIllette Razor Company, and Sonoco, among others. With over 130 years of experience, The Austin Company is one of the country’s preeminent engineering and construction firms whose list of clients covers a wide range of industries from aerospace to food service. In the past, The Austin Company has worked with internationally recognizable organizations such as Proctor and Gamble, General Mills, The Boeing Company, Danisco, and Unilever, among others, to design, construct, and maintain some of the world’s most innovative manufacturing facilities. The company will be serving as design, engineering and construction consultants and offering a host of process operations improvement services to Be Green in the months running up to the plant’s opening. In a consumer driven marketplace there are few actions that speak as loudly as “voting with your wallet” and as Pira International’s latest packaging industry survey reveals, companies are indeed listening. The firm recently released a comprehensive marketing intelligence report entitled The Future of Sustainable Packaging to 2020: Convenience Vs the Environment, which outlines a dramatic shift in perception within the packaging industry regarding sustainability. The research firm chose to approach the study from a “consumer-based” perspective, seeking to understand exactly what forces are driving the marketplace. Pira interviewed key players in the global packaging supply chain in order to understand what they considered to be the largest drivers of growth in the sustainable packaging industry. According to Pira, sustainability is defined as growth that meets the needs of the present, without compromising the ability of future generations to meet their own. The results of the study showed that 79% of the respondents felt consumer awareness of environmental issues and new material developments were the most important factors driving growth within the field. Based on the results of the study, the researchers concluded that “…the packaging industry cannot help but become the sustainability focal point and primary benchmark for other industries.” Linda Casey of Packaging Digest went on to state “Not only is packaging a resource intensive sector in an increasingly resource constrained world, but tons of packaging waste are ending up in landfills daily.” Considering these factors, it becomes quite clear that the potential for innovation within the industry is huge. Major companies are beginning to take note and a few have stepped forward to lead the “sustainable packaging revolution” by adopting forward-thinking solutions that eschew traditional petroleum-based plastics. In the public sector, Whole Foods Market, Proctor and Gamble’s Gillette Razor Company (UK), and Pepsi Co. are among those that have led the charge by adopting 100% recyclable, plant-based packaging for use on some of their products. With many of the worlds most recognizable brands preparing to follow suit, it is only a matter of time before truly sustainable, plant-based packaging becomes an industry standard. The large scale adoption of plant-based packaging currently underway is helping to create economies of scale that will encourage companies that may have initially been reluctant to adopt sustainable packaging due its high price to reconsider their decisions. This is especially true in light of the recent surge in oil prices that continues to make traditional petroleum-based plastic packaging look less favorable by the day. In addition to measuring drivers of growth, Pira’s study also identified major barriers that need to be overcome in order for sustainable packaging to be adopted on a wider scale. Researchers concluded that there is a significant level of confusion surrounding “eco buzz words” such as biodegradable, compostable, recyclable, recycled, and other variations on these and similar terms. While there is a growing number of highly educated eco-enthusiasts that intentionally seek out green products, the reality is that the average consumer is overwhelmed by the growing list of vaguely defined and often overlapping terms used to market and describe sustainable packaging. The study’s authors suggest that both the packaging industry and consumers need to work together to develop a unified set of standards that will end confusion and maintain transparency in the rapidly growing sustainability sector. Independent organizations such as the Cradle to Cradle Products Innovation Institute have developed their own strict standards that could potentially serve as a framework for future legislation. A list of packaging companies that are currently certified by the organization can be found here. While the report’s overall outlook is certainly positive, there nonetheless remain significant hurdles that need to be overcome in the rapidly growing field. If consumers are indeed the major drivers of growth within the industry, it is imperative that they understand just what it is they are getting. To find out more about Pira International or to purchase a copy of the report, visit their website at www.pira-international.com.